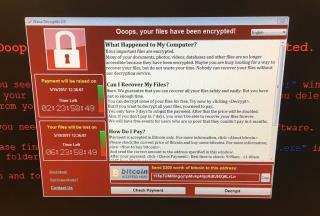 A primer: CNN’s breakdown and timeline of the WannaCry attack, which some are calling the largest cyberattack ever executed, will catch you up to speed on what happened. The attack exploits a vulnerability in Microsoft Windows. About ransomware: The anonymous attack comes in the form of ransomware, a type of malware that locks a computer’s files, making it impossible to access them. On the locked screen, users are instructed to pay up a sum within a time frame—in this case $300 to a Bitcoin account within three days. Tech blogger and expert Troy Hunt explains more in detail. Windows users: If you're using Windows XP, upgrade quickly, advises a Q&A in the Irish Times. If you're already infected, the fix isn't easy, but Microsoft has the particulars. Are Macs safer? In this case, yes. WannaCry affects Windows systems, but not Macs. Apple computers tend to field less attacks, but according to the International Business Times, it’s not because Mac security is impenetrable. Since PCs are more widespread, more viruses are written for them. Shoring up your digital security: The New York Times outlines eight general steps that can help your digital thumbprint from mobile to desktop, like using apps such as Signal or WhatsApp when texting. NSA's role: Some of the key code utilized may have been created by the NSA, reports the BBC. It raises the question of whether government agencies should disclose the vulnerabilities they've discovered. Edward Snowden concurs: "In light of today's attack, Congress needs to be asking @NSAgov if it knows of any other vulnerabilities in software used in our hospitals," he wrote on Twitter. Bitcoin in spotlight: Bitcoin, the anonymous digital currency, saw a drop in value on Friday from $1,800 to $1,600, according to CryptoCoin News, before it stabilized to $1,700 Saturday. Some experts think hackers might be trying to manipulate the currency to boost profits. The site looks at how the attack could affect the currency, for better or worse. I find it suspicious that Microsoft is getting what it wants from a terror attack. Suddenly everyone has to upgrade to Windows 10 or the terrorist will shut you down. This is exactly the response the company needs to sell an unpopular dog to the business community. If Russia or China find them first, I hope they publicly execute them. I'm an idiot but, I heard that the US Gov. insisted on leaving a back door on all programs so they could access at will, and those doors are making it available to attacks.